The year’s halfway over, but it’s not too late to add one of four of these bathroom trends to your space. Besides, we’re pretty sure these trends won’t be going out of style anytime soon—2014’s trends are a mix of timeless style, functionality, and high-tech convenience. 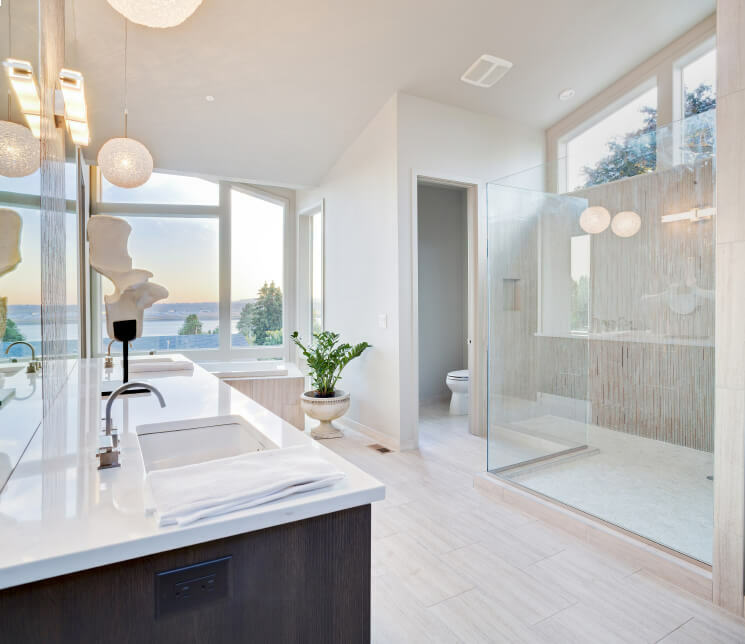 Here’s a roundup of some of our favorite bathroom trends this year. Perhaps taking a cue from Japanese culture, people are designing their bathrooms to include a freestanding tub in addition to a separate shower stall. While some may picture an old, chipped porcelain clawfoot tub with squeaky hardware, modern freestanding tubs are sleek and just plain gorgeous. If you have the space in your bathroom, the added luxury of one of these tubs is sure to bring that “wow” factor as the focal point of your bathroom. Showers with a curb? Yeah, right. So 2013. 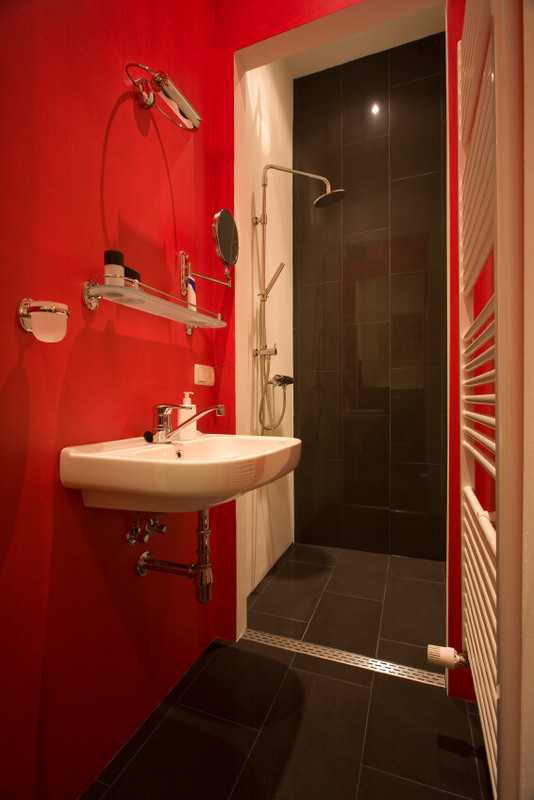 Curbless showers seamlessly integrate into your bathroom since there’s no break in the floor. This can make a small bathroom feel larger. Clean lines and clutter-free rooms will always be in style, and floating vanities do just that by mounting to a wall and leaving space below to open up the space and create the visual effect that it’s just hovering there, patiently waiting for you to wash your hands or brush your teeth. Lighting installed underneath the vanity can add depth and drama. 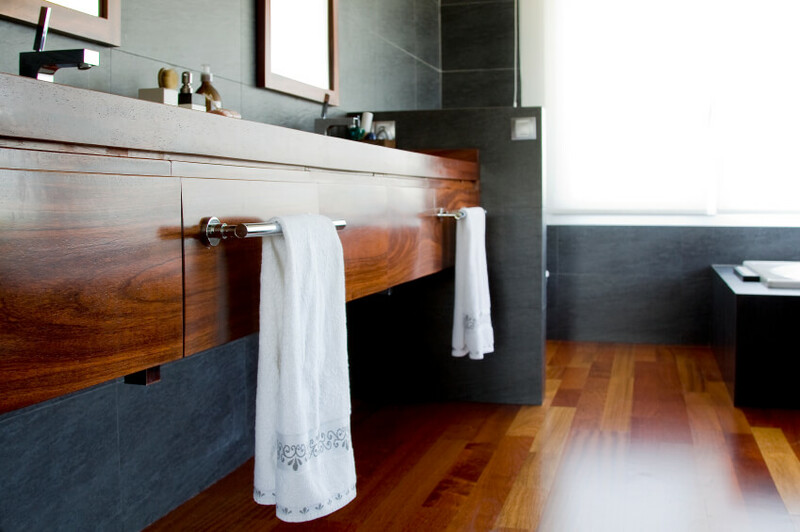 One sink, two sinks, dark wood or bamboo—there are a ton of design options to complement the rest of your bathroom. Amazing bathroom design by Christopher Patrick Interiors. Just as 2014 fashion trends are seeing lots of colors and pattern-mixing—whimsical prints paired with striped skirts, for example—one of the biggest bathroom trends in 2014 is bold colors and tiles. A wall of vertical-laid turquoise subway tile can be set off by black-and-white square floor tiles arranged in a geometric pattern. Or use a colorful wallpaper with slate tiles. Tiny bathroom? No problem. In fact, that’s where we’re seeing the boldest colors. We’ve come a long way since those clunky plastic shower AM/FM radios that run out of battery power in five seconds. If you like to unwind in the evening with a long soak in the tub as you hum along to the latest from Lady Gaga, Kohler’s VibrAcoustic Bath was pretty much made for you. This high-tech tub gives the bather “full-bodied sound”—it’s both a bathtub and a boombox, and though it comes with four original compositions, you can connect your Bluetooth-enabled devices. Wireless speakers specially made for the bathroom are water-resistant and engineered to sound good even in a room that’s not so conducive to great acoustics. Seamlessly integrate a sound system with Duravit’s mirror cabinets, which have built-in wireless speakers. Brushing your teeth every morning to “Eye of the Tiger”? Now that’s a morning routine. Eliminate hand towels with the Dyson Airblade Tap: this simply designed gadget is both a faucet and a hand dryer that runs a 400mph blast of air for 15 seconds to get you seriously germ-free. See yourself in the best possible light—one that’s also a focal point of your bathroom. This often-overlooked element is key to making your bathroom all it can be.